This past Saturday, my friend Faith and I headed into New York City for some meetings and to catch up with friends. On a related note, weekend brunch is “a thing” in NYC, which I love. It’s a tradition I embraced this summer, and made it my goal to hit up a new brunch spot every weekend. This trip, Faith and I made brunch plans with our good friends Megan and Rachel. 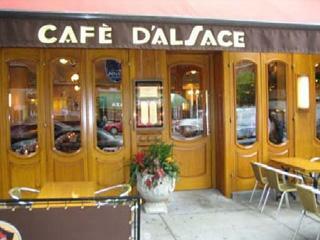 Megan suggested that we go to Cafe D’Alsace on the Upper East Side. The atmosphere, prices, and brunch offerings were fantastic. I ordered the pear and chestnut crepes and if I could eat them for breakfast every day forever, I wouldn’t hate it. So naturally, I decided to search for a recipe to help make that dream a reality. I couldn’t find an exact match, but I found a decent recipe for pear crepes, and a separate one for chestnut spread. Get creative and throw the chestnut spread in the crepes, and I think a homemade attempt could rival the restaurant’s recipe.